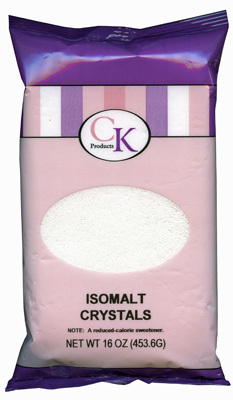 Isomalt Crystals are cooked down with water to create everything from sugar gems to sugar show pieces. 1 pound bag is shown. HINT: Prepare Tools prior to applications. BREAK-UP PIECES: Prepare sheet pan or a Silicone mat, spraying with vegetable oil. USING MOLDS: Prepare molds, spraying with vegetable oil. Using Candy Funnel, pour hot syrup into molds and allow hardening for 10 minutes. Unmold onto waxed paper or silicone mat. If weather is humid, wrap in candy bags to prevent becoming cloudy. **PRECAUTIONS TO PREVENT BURNS: Keep bowl of ice water near by in case of skin contact. Always use latex gloves.